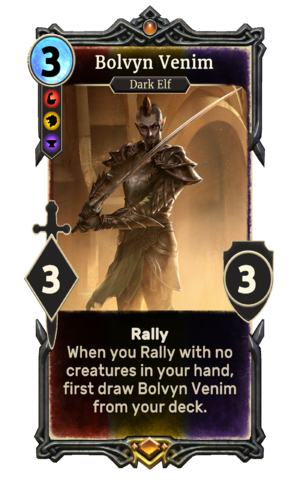 Bolvyn Venim is a unique legendary House Redoran creature card. It is part of the Houses of Morrowind expansion. In addition to the card's availability in the Houses of Morrowind expansion, one copy is included in the Redoran Onslaught theme deck. "I would rather die than see House Redoran dishonored." "I shall prove my right to rule!" This is the only card to have a unique effect that is active while in your deck. Bolvyn Venim first appeared in Morrowind. This page was last modified on 2 March 2019, at 00:45.